The TakeAIM system was recently reviewed on FinancesOnline, a comparison website helping millions of users compare products, find customer reviews and reports from experts so that business owners can find the best solution to fit their needs. We were pleasantly surprised to be awarded not one but two awards for our Asset Inspection Monitoring System. Accolades like these confirm that our system is successful. The team at TakeAIM know we have something special so receiving positive feedback further emphasises the growing appreciation of our system. Within the review, FinancesOnline highlighted the main benefits of using the TakeAIM system. They go into extensive detail regarding the features which they found to be beneficial and the business issues which TakeAIM can resolve. Below you can find several highlights from the review, as well as how they appreciated what TakeAIM is, the benefits it provides to businesses, and the key problems it can solve. According to the software experts from FinancesOnline, TakeAIM eliminates the need to rummage through stacks of files to check specific information on your equipment, such as its date of repairs or usage history. Whilst the team at TakeAIM were developing our equipment monitoring system, one of our main focus points was the requirement to reduce paper consumption, potential loss of audit trails and the inability to notice recurring trends within paper based systems. The last ten years has changed the way we use technology, it was only right that equipment monitoring followed suit. As stated by the FinancesOnline review team, TakeAIM helps users neatly organise and manage all records on equipment history on a single platform. We believe that having an extensive record of your equipment can only help ensure its productivity and safety. The ability for management to view an equipment history, whether based on brand, location, equipment type etc ensures that they can not only manage spot recurring issues but also analyse which pieces of equipment are better for their specific business. 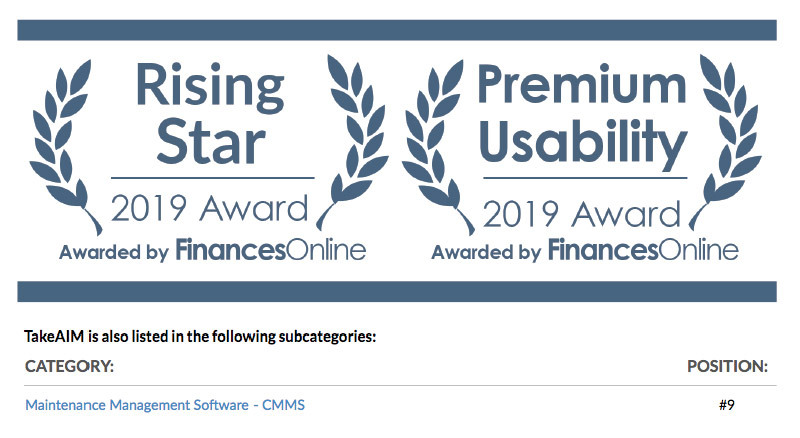 Highlighted as one of the top small business maintenance management software systems, TakeAIM’s “seamless and efficient workflows,” from setting repair schedules down to internal communication for smooth collaboration, were highly commended by the software experts. Communication is key in any business, to often we hear of members of staff making note to raise a concern regarding a piece of equipment, however in the rush to get home they forget to relay the information to the next shift worker. TakeAIM ensures complete transparency to all members of staff. The platform / APP implements an automatic communication system once inspections have been completed but also enables manual communication between higher management, administrators, warehouse staff or site workers. Ensuring that your assets and equipment are not only at peak condition, but also get prolonged service lives is another benefit provided by TakeAIM, stated the FinancesOnline reviewers. There are many benefits of using the TakeAIM system as part of a preventative maintenance regime but we agree with FinancesOnline that maximising the life of equipment is beneficial for all businesses. By implementing regular equipment inspections the chance of spotting a fault early, before it deteriorates further, are greatly increased. Early detection of damaged or faulty equipment can help to prevent accidents and reduce expensive maintenance / new equipment costs. The FinancesOnline experts believe that many companies today find difficulty in guaranteeing execution of pre-use equipment checks at all times. This is why they were glad to find out that our software allows for check-listing of inspections, complete with notifications for missed inspections. Too often we've heard of workers quickly falsifying equipment inspections when they know management are coming to check over the details. When we were developing TakeAIM the team were determined to solve this very popular issue, we therefore implemented time stamps. Each time a piece of equipment is inspected it records the time the inspection was started/ finished, the date, inspectors name, signature, and equipment status. These details ensure that the inspection has been completed correctly, regularly and the inspector is taking responsibility for the details within the inspection. According to the FinancesOnline team, one of the key problems TakeAIM is able to solve is ensuring that “ALL” equipment are easily checked. The Provision and Use of Work Equipment Regulations (PUWER) 1998 impose specific legal duties on companies to provide, inspect, maintain and operate safe work equipment. We wanted to provide a equipment inspection solution which enabled companies to check absolutely anything they wished to, whether that be a Guillotine, Circular Saw, Fire Extinguisher or Combine Harvester, if it's used for work, we wanted TakeAIM to be able to inspect it and monitor the equipment in an easy to use dashboard. We realise that when you make a decision to buy a Maintenance Management Software - CMMS it’s important not only to see how experts evaluate it in their reviews, but also to find out if the real people and companies that buy it are actually satisfied with the product. That’s why being reviewed by FinancesOnline was so important to us. We wanted their behaviour-based Customer Satisfaction Algorithm™ to gather our customer reviews, comments and TakeAIM reviews across a wide range of social media sites in order to show how many people had positive / negative experience with TakeAIM. Click here to find out more about TakeAIM or visit FinancesOnline to read the full review of our system. New equipment inspections available on TakeAIM APP. The ability for our customers to inspect all workplace equipment was one of our goals when creating the TakeAIM APP. Enabling our customers to have one system to audit, inspect, monitor and maintain ALL workplace equipment, no matter how unique, was a key feature in our quest. TakeAIM enables us to add new equipment inspections quickly and easily and to all of its customers instantaneously. It also enables you to add any type of equipment type you require. As the TakeAIM system grows in popularity we've noticed a rise in certain equipment inspections being created, therefore we have added these equipment types to our standard equipment range and amended the inspections based on Health and Safety advice and best practice. The Bench Drill: This type of drill is used for drilling light weight pieces of material. There are many elements that make up a bench drill which can fail, break or shatter. Elements such as the guard should always be securely in place and free from damage. Ensuring employees inspect a Bench Drill prior to use will assure only equipment deemed in good condition is being used and helps aid PUWER compliance. The Bench Grinder: Depending on the bond and grade of the grinding wheel, the bench grinder may be used for sharpening cutting tools or to roughly shape metal prior to welding or fitting. Ensuring employees inspect the condition of a Bench Grinder prior to use will assure only equipment deemed in good condition is being used and helps aid PUWER compliance. The Mitre Saw: Also known as a drop saw, is a power tool used to make a quick, accurate crosscut in a work-piece at a selected angle. A poor;y maintained mitre saw can be a severely hazardous tool. Incidents could include electric shocks, fire or personal injury. Ensuring employees inspect a Mitre Saw prior to use will assure only a mitre saw deemed in good condition is used and helps aid PUWER compliance. In addition we have also added a DSE inspection checklist, enabling you to complete a workstation audit to ensure the set-up is suitable to the person using it. Under the "The Health & Safety (Display Screen Equipment) Regulations, employers must carry out a risk assessment of workstations used by employees to reduce any identified risks. Our latest checklist helps your organisation meet and monitor those obligations. A court heard how, on 31 May 2017, Mr Howes, aged 26, was removing a ‘genie lift’ from the forks of a lift truck on the upper floor of the building. Mr Howes stepped backwards and fell through a stairwell opening, sustaining multiple injuries including a fractured spine, a fractured skull and a small collapse of one of his lungs, and was hospitalised for six days. Mr Howes still attends physiotherapy as outpatient and has not yet been able to return to work. An investigation by the Health and Safety Executive (HSE) found that the risk assessment identified gaps in the floor through which a worker could fall. However, they failed to put in place any measures to either prevent or mitigate the consequences of a fall. Such measures include the use of fixed edge protection systems to prevent falls or the use of fall arrest harnesses to mitigate falls. The company pleaded guilty to breaching Section 2 (1) of the Health and Safety at Work etc Act 1974 and was fined £20,000 and ordered to pay £1,020 in costs. It is virtually impossible to remove all risks from all work situations but managing risks and raising awareness of hazards can go a long way to ensuring employees remain safe whilst on site. At Good to Go Safety we have supplied over 2 million equipment checklists over the years, each one of which could help to spot a fault and prevent a resulting accident form occurring. Historically these checklists have been limited to the most common types of workplace equipment – such as ladders, scaffolding, forklifts etc, but with the launch of our new TakeAIM app we’ve now opened up the possibility to create any checklist from scratch, quickly and easily. This means that companies can even put together their own site survey checklist – identifying if edge protection/barriers are missing, and further strengthening onsite safety procedures. The possibilities are limitless and you can test out the full capabilities of the TakeAIM system with a free 7-day trial >> Click here for more information. Imagine if a fault was found by a member of staff when using an item of workplace equipment. They make a note to raise the concern to the following shift worker, however in the rush to get home they forget to relay the information, resulting in a costly accident. What if you could ensure all workplace equipment is inspected and the findings of those inspections are instantly available to all members of staff and your maintenance/management team? Our products encourage pre-use inspections of workplace equipment. The systems we've developed are highly flexible to meet the demands of all industries. By introducing a visual check of equipment before the start of each shift, it eradicates the assumption that the equipment is safe and has already been checked because it had been used by the previous shift worker. It places a responsibility on every employee to carry out inspections and take some responsibility for their own safety. By carrying out hand-over checks whilst both the incoming and outgoing workers are ‘crossing over’ it further strengthens the opportunity to raise any issues or concerns that may have been noted. Our tagging and checklist systems can help to improve safety, reduce maintenance costs and comply with PUWER / LOLER obligations. 7 DAY FREE TRIAL on our TakeAIM APP. 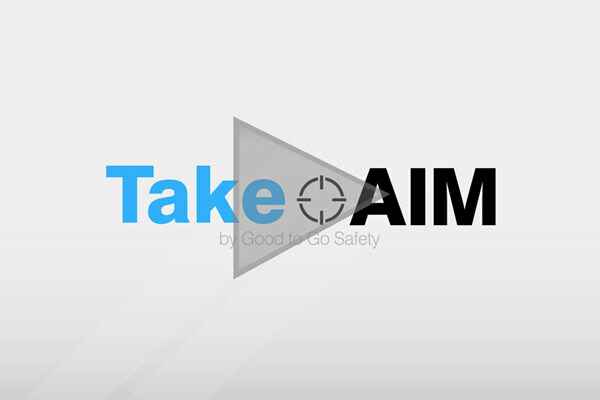 We are offering a FREE 7 Day Trial package to anyone who signs up – simply register your details at takeaim.goodtogosafety.co.uk/register download the app on either the Apple APP store or on Google Play and discover the many features and benefits that TakeAIM can provide. TakeAIM is an auditing, equipment inspection and maintenance app used to help companies manage workplace equipment. Combined with the analysis website, TakeAIM provides visibility and insights to help reduce maintenance down time and improve safety. Your team can inspect all assets, identify quarantined equipment and communicate issues directly to their head office. Helping managers analyse equipment and spot re-occurring issues to help resolve them before they happen in the future. This digital inspection system monitors maintenance and inspections in real-time, you can set reminders and have access to all records without the need for paperwork. The app offers access to an unlimited number of users and assets, and you can even create additional equipment checklists quickly and easily if you can’t find the one you need. Assign QR Codes & Scan Equipment by creating an asset register. Make your inspections even quicker and easier to complete by assigning QR Codes to pieces of equipment. Once assigned, your inspectors can simply scan the QR Code which will then take them directly to the correct inspection checklist and record the findings. TakeAIM allows photos and notes to be added during the inspection, and time/date stamps document the inspection process. Upon sign-off the completed checklist is automatically sent to your admin where the findings will be used to generate reports and analysed to identify common faults and trends over time. When we first launched Good to Go Safety back in 2009 (yes we've been around that long) we knew we had something special and were determined to shout about it. During the early years of trading, customer feedback was exceptional from those using the system, but we didn't get the expected uptake we knew our product deserved. 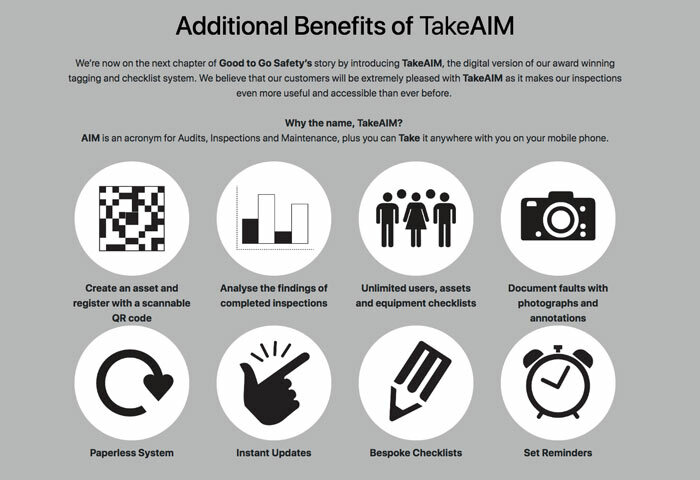 We’re now on the next chapter of Good to Go Safety’s story by introducing TakeAIM, the digital version of our award winning tagging and checklist system. We believe that our customers will be extremely pleased with TakeAIM as it makes our inspections even more useful and accessible than ever before. Good to Go Safety work tirelessly to help provide a safer workplace environment and promote best practices and now we enable our customers to analyse equipment and spot re-occurring issues to help resolve them before they happen in the future. As a customer or someone that has registered an interest in our award winning equipment tagging and checklist systems we wanted you to be the first to know about our exciting new mobile app, due for release in January 2019. 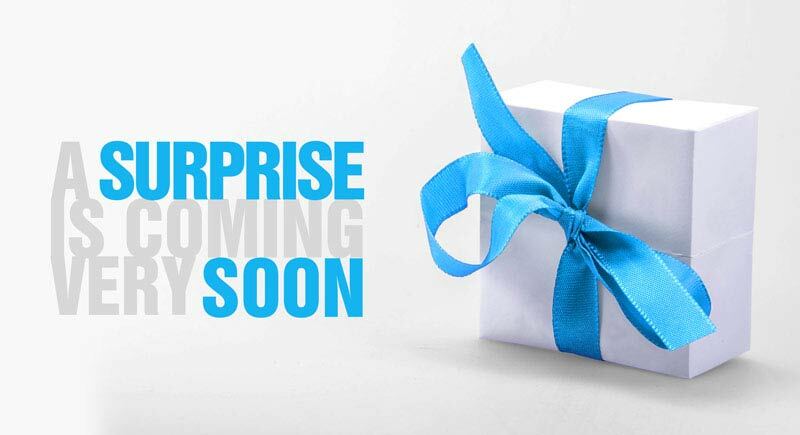 By way of a thank you we are offering a FREE Trial package to existing customers that pre-register an interest in the app – simply register your details below and we will contact you with details on how to access the app and discover the many features and benefits that TakeAIM will provide, prior to its January launch. TakeAIM is an auditing, equipment inspection and maintenance app used to help companies manage workplace equipment. Combined with the web platform TakeAIM provides visibility and insights to help reduce maintenance down time and improve safety. Your team can inspect all assets, identify quarantined equipment and communicate issues directly to their head office. Helping managers analyse equipment and spot re-occurring issues to help resolve them before they happen in the future. AIM is an acronym for Assets, Inspections and Maintenance – and you can Take it anywhere with you on your mobile phone. The app will offer access to an unlimited number of users and assets, and we can create additional equipment checklists quickly and easily if you can’t find the one you need. The ladder used was previously found to have a fault but had no labelling on it to advise against use. Westminster Magistrates' Court heard that Angelina Lawson suffered neck injuries in the accident while removing droppings from a shelf under the birds' perches. Angelina was working at a height of 2.5 metres when the ladder gave way and she fell to the ground. The Zoological Society of London, the charity which runs the zoo in Regent's Park, appeared in court and admitted two breaches of the HSWA 1974. It was fined £40,000 and ordered to pay £8,000 in costs. In delivering his sentence, District Judge Richard Blake said: "Ms Lawson had not received any training with regard to the use of ladders during her four years of employment. The lack of that training was a direct cause of the accident. This story is a perfect example of the dangers of assuming that a equipment is safe. It highlights the importance of both pre-use checks and also the importance of tagging faulty equipment to clearly display a Do Not Use message if/when a fault is found. To find out more about the Good to Go Safety system which enables employees to do both of the above click here. The company, which has now made the safety improvements, has been fined £32,000 and ordered to pay costs of almost £5,000 after admitting the breaches. The dangerous state of the warehouse was discovered by an environmental health officer from the council during a routine inspection. The officer found several areas of damaged, bent and unsafe racking and saw staff using damaged ladders to reach goods at height. When the officer asked how staff get stock at the back of the pallet racking without leaning a long way out of the scissor lift or climbing onto the racking itself, staff and managers gave no explanation. In theory I like the idea of using ‘common sense’ as part of your safety policy but unfortunately not everyone has the same level of common sense, and some seem devoid of it completely. You also need to supply the necessary equipment to allow safe operation of tasks, without which common sense would tell me to walk away until it is safe to return. It is scary that situations like this still occur in warehouses across the UK – with so much training and so many products available to ensure safety and understanding there can be no excuse for allowing staff to work in such dangerous conditions, nor for allowing equipment to fall into such levels of disrepair in the first place. If these guys had invested just a small amount of money on a system such as Good to Go Safety it would have allowed employees to carry out routine daily checks of racking, ladders and forklifts and allowed them to spot faults early, before they developed into this dangerous level of wear and tear. By ignoring the need for training employees and ensuring routine equipment checks were carried out (and actioned upon) a low cost investment into the company’s safety programme was ignored which led to a significant £32k fine – now where is the common sense in that trail of thoughts? It’s good to read that they have made the necessary safety improvements since the fine, it’s just a shame they left it so late. Hopefully it will serve a reminder to the many other similar companies out there that continue to ignore the need for safety checks. 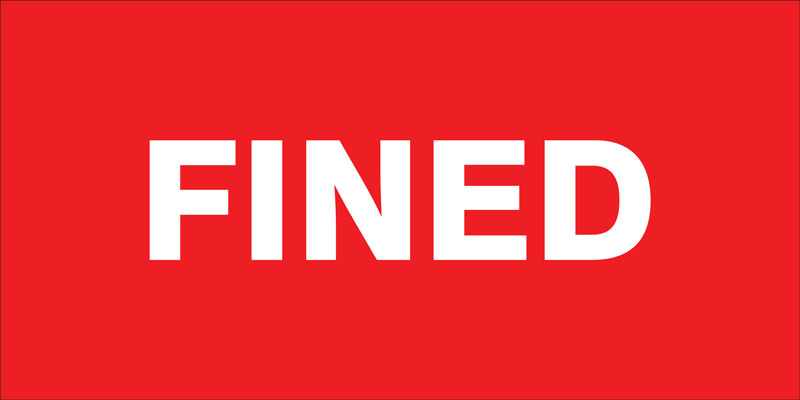 If you are one of those companies then please check out our products to see how they can help prevent you from being fined by ensuring equipment is maintained in good working order, as per your obligations under PUWER, LOLER and various other H&S Regulations. By carrying our routine daily checks, recording and auctioning up on the findings you not only improve safety, you actually end up saving money on maintenance costs by repairing minor faults before they develop into something more serious. Our system also removes any doubts/uncertainties by clearly displaying the date and findings of the latest inspection and provides management copies as part of a paper audit trail – documenting a good and reliable safety & maintenance programme. It really isn’t worth ignoring the warning signs, simply because an accident hasn’t happened YET – you are still liable to prosecution simply by placing employees in danger. According to the Forklift Truck Association (FLTA) there are 1,300 forklift accidents each year which averages out at five accidents in a single day. Ensuring employees are properly trained and know the importance of pre-use forklift truck checks is crucial. Statistics from the HSE show that nearly 25% of workplace transport accidents involve forklift trucks. It's not unusual for managers and supervisors to have had no formal training in forklift truck safety. The result of this is that supervisors are often not able to recognise risks and take action before a problem occurs. Carrying out forklift inspections with Good to Go Safety can reduce the risk of accidents and any unnecessary maintenance costs to forklift trucks. Not only does Good to Go Safety ensure forklift trucks are safe to use, but it also helps employees familiarise themselves with their forklift truck. Statistics from the HSE show that nearly 25% of workplace transport accidents involve forklift trucks. The majority of these accidents are caused by poor supervision or lack of training. Employers need to be made aware that staff training falls into three genres. 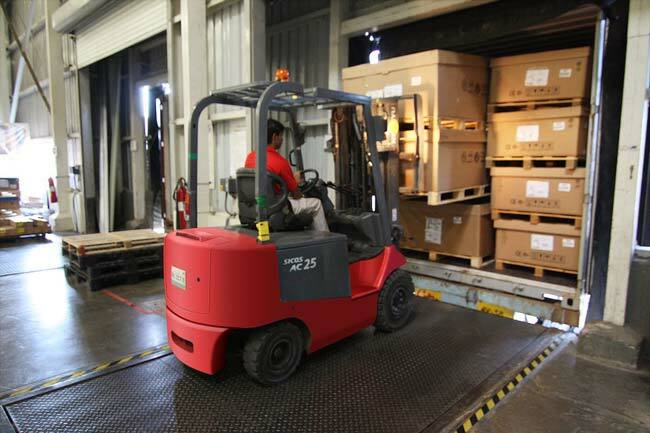 1, Basic forklift training takes place off premise and is usually extremely comprehensive. 2, Specific job training follows basic training and allows staff to develop and practise in conditions similar to their own workplace and 3 is training on site where staff are able to familiarise themselves with their workplace and apply learnt skills. Employees with basic forklift training and certification to prove their competence will likely need additional training before operating alternative types of forklift trucks to those they are accustomed to. There has been a 27% increase in forklift drivers taking conversion courses which enables experienced forklift drivers to gain additional experience on a wider variety of forklifts. You've seen a number of developments from Good to Go Safety throughout 2018. Some of these developments include two new inspection checklists for Tow Tractors and Telehandlers, a website facelift and new pre-use inspection posters for Excavators and Harnesses. As ever though, we refuse to stop working towards our goal "To help companies improve workplace safety, reduce maintenance costs and comply with all app licable legislation" and have been working tirelessly to create something we believe our customers will be as excited for as we are. It seems very cruel to tease you with this "huge unveiling" that's coming soon, so in the meantime i'll be nice and remind you that we still have our 10% OFF Telehandler products until 1st of Sept 2018. If you're really keen to know what we're up to you can always go to our download page where you can find all the appropriate regulations and legislation in regards to our equipment types. You may find something to analyse on that dashboard. If you're still struggling why not Tag and Question us on twitter and we'll Rattle you're brain with a few more clues.